Maggie worked the opposite end of the equation, with the same lack of success. “I love my sister, but I was not into the idea of meeting anyone she would set me up with,” said Daniel. The close friends decided to have dinner out together to say goodbye for Christmas break. On 12/12/12, Allie drove to Maggie’s parents’ home in Phoenixville and hopped into her friend’s car. Before dinner, Maggie asked whether they could pop in to a local tattoo parlor so she could get a touch-up on her foot. That seemed rather random, but Allie was up for whatever. As the needles did their work, Maggie took out her phone. He walked in to one awkward introduction. “I didn’t know Allie was there,” Daniel said. Daniel was pragmatic — his sister had managed to get him to meet this girl. And, hey, she was cute. He might as well talk to her. Allie was shy back then, and at first didn’t feel like forcing herself to talk to a guy she had told her friend she didn’t want to meet. But the more Daniel talked, the more she thought he wasn’t so bad, or so weird. Once the tattoo mission was complete, Allie and Maggie walked to Iron Hill Brewery for dinner, and Daniel went home. When Allie got back to her car, she found a piece of rolled-up paper with his phone number stuck into the door handle. She texted him as soon as she got home. It started lightly enough: She told him about her anthropology and archaeology classes, he told her about his in communication. They moved on to deep analysis of movies from Drive to District 9, and then to art and life in general. “Even though our initial meeting had been a little flat, we had both recognized this connection. And when we were talking, it really proved we were right,” Allie said. Daniel Kochinsky and groomsman (from left) Kevin Foedinger, Kevin Garcia, Kenny Cooper, Daniel Kochinsky, Nicholas Proko, Mark Rodgers, Matt Sortino, and Brian Gyuris. In late January, they decided to be exclusive. Daniel, now 28, is an administrator at the Shops at Devereux vocational center in Devon. He is studying online for his master’s in clinical counseling through the University of the Cumberlands in Kentucky. After graduating, Allie, now 27, took a job at Historic Yellow Springs and soon found her favorite part was planning with couples who married. In 2015, she launched her own event and wedding planning business, Alexandria Catherine Events. Daniel lived in Phoenixville with his parents, Denise and Leon, and Allie in Downingtown with hers, Steven and Michele — to save money. In 2017, they bought their Coatesville home, which they share with Rufus, a Yorkie/Jack Russell mix. On a dreary, wet Saturday in May 2018, Daniel asked Allie to walk Rufus with him. She didn’t bother showering or changing out of her weekend grunge. Daniel, not usually the plan-ahead type, had suggested days earlier that they visit Chanticleer, and she deduced something important would happen there. “I figured I’d come home, get cute, and then go get engaged,” she said. They came home, and Daniel slowed his pace slightly to let her get a few steps ahead. When she reached for the door, he called her name. Allie turned to find him kneeling on the porch. She heard him ask if she’d marry him, though. And so did Rufus, who, like Daniel, seemed to be waiting for her answer. “I did say yes. I got that out,” Allie said. The sun came out, and they smiled their way all around Chanticleer. As the bride had always dreamed, they served wedding waffles at the reception for 70. That meant an 11 a.m. ceremony at Cape May’s Hotel Alcott. Matchmaker Maggie was maid of honor. A family friend who happens to be an officiant presided over the ceremony, which the couple designed to be sacred but not tied to any particular religion. The groom’s cousin-in-law Jenn read that love lets one find all the hidden beauty in another person. His Aunt Jeanne also did a reading. Later, the couple had dinner with their bridal party, and all were invited to join them for an after party at Carney’s. A bargain: The couple skipped favors to spend the money elsewhere. 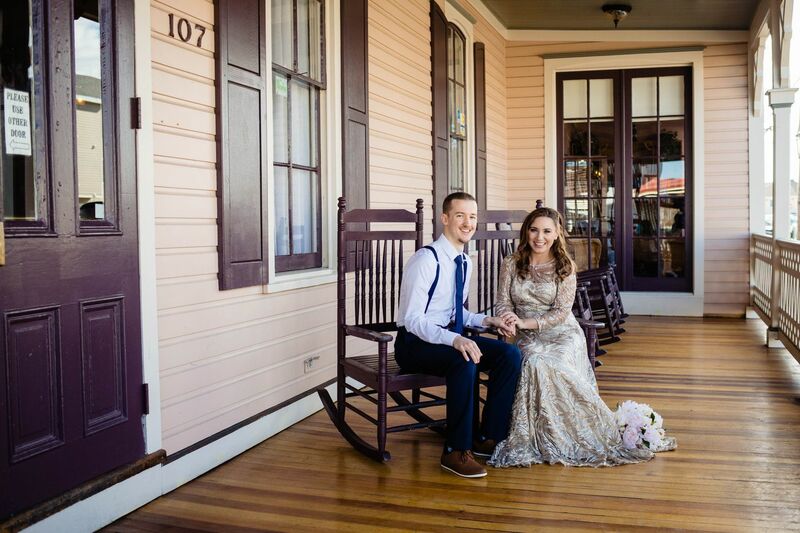 A splurge: The Hotel Alcott cost a bit more than other venues the couple could have chosen, but Allie wanted to marry at a place where she’s never planned a thing, and she and Daniel fell in love with the historic building and quaint town. A Caribbean cruise to Nassau, St. Thomas, and St. Martin, where they will soak up history and swim with sea lions. Officiant: John Hayduk, Hayduk Wedding Services, Coatesville. Venue: Hotel Alcott, Cape May. Cake: Amanda Scamoff-Dyas, the Bake Works, Northfield, N.J.
Music: Scot Silver, Scot Silver Music, Phoenixville. Photography: Jill Godbout, Emery Jude Photography, Downingtown. Bride’s hair: Mel Nguyen, Chester Springs. Makeup and bridesmaids’ hair: Daneene Jensen of Daneene Jensen & Associates, Doylestown.